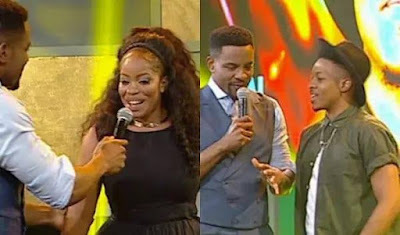 These are the two new "fake" housemates introduced into the big brother naija house today, Jon and Ese. Jon is an upcoming music artist, a TV personel and a former reality TV winner. He is from benue state. Ese is a beauty queen and a comedienne, she is from Edo state. Both housemates has been thrown into the house to keep the other housemates on their toes. Big brother feels that the remaining eleven housemates are too relaxed and needs to up their game, in other to win the much coveted #25m. Meanwhile, the old housemates are not aware that the two new housemates are fake and are not contesting for the prize money. The next couple of weeks will only get interesting in the big brother naija house.